Free shipping. Buy direct from HP. 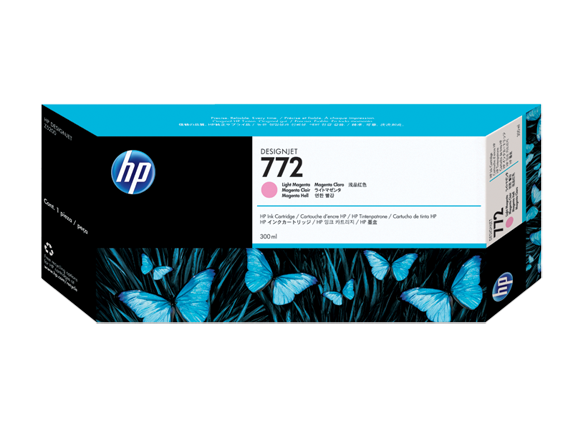 See customer reviews and comparisons for the HP 772 300-ml Light Magenta DesignJet Ink Cartridge. Upgrades and savings on select products. Offer your customers over 200 years print permanence on a range of HP creative and specialty media. You've got millions of color combinations to work with.Impress your customers—show off the smallest details in the shadows.Enjoy easy, productive, high-quality printing with HP printing materials innovation. 1 Display permanence rating for interior displays/away from direct sunlight, under glass by HP Image Permanence Lab and/or by Wilhelm Imaging Research, Inc. on a range of HP media. For details, see http://www.globalbmg.com/hp/printpermanence. 2 Program features and availability may vary by country. For more information, visit http://www.hp.com/go/lfprinting/materials-supplies. 3 In the circa 45 countries and territories in which the HP Planet Partners program operates. Program features and availability varies. Where this program is not available, and for other consumables not included in the program, consult the Material Safety Data Sheet (MSDS) available at http://www.hp.com/go/ecodata to determine appropriate disposal.